Crooked teeth affect a lot of adults and many people with misaligned teeth feel self-conscious and embarrassed about their teeth when they laugh, talk and smile. Braces are predominantly used to correct crooked teeth but often this process can take 18 months to 2 years to be fully completed. However, S10 Dental are happy to offer you the very latest in orthodontic treatments, Six Month Smiles. 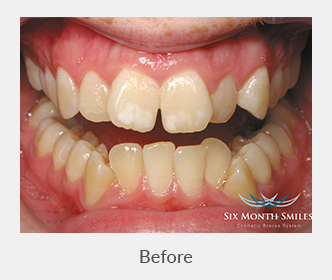 This amazing brace system can give you the perfect smile you’ve always wanted in as little as just 6 months. To help our anxious patients, we offer sedation during appointments. We want you to feel completely comfortable during your visit — because we know you will love the results. 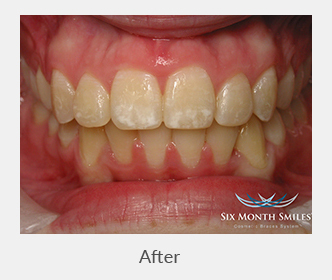 6 Month Smiles focuses on the teeth that are most noticeable when you smile, often referred to as the ‘social 6’. This is why the treatment takes less time to be completed than other brace systems, which can often take between 1 and 2 years to fully realign the teeth. 6 Month Smiles braces are created by using the most advanced technology and use non-friction wires made of titanium to quickly and gently guide the teeth into the desired position. The braces are also tooth-coloured, which means they are discreet and less noticeable when you smile than traditional fixed orthodontic systems. 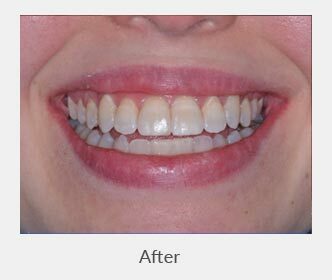 Are 6 Month Smiles braces comfortable? 6 Month Smiles braces are more comfortable than some other orthodontic systems due to the low level forces it uses to move the teeth. There are no metal bands, which means irritation and friction is greatly reduced. After treatment, you will be advised to wear a retainer to prevent the teeth from moving back to their original position. 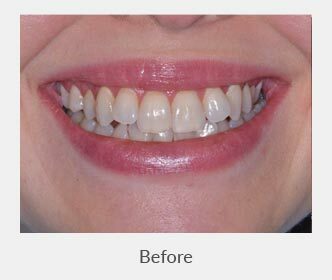 The retainer will also ensure that your teeth remain perfectly straight once the treatment is complete. Comfortable – these braces utilise a lower level of pressure and the non-friction wires allow the teeth to move quickly. Quick – this treatment is usually completed in 6 months, much faster than other orthodontic systems! Discreet – the wires of this brace are very fine and are designed to match the shade of your teeth. Great value – as the treatment time is shorter than that of many other brace systems, it tends to cost less as well.